There was a big thunderstorm in Taipei yesterday afternoon during the third day of our APEC OVOP Workshop on E-Commerce. At left is a picture of the Taipei 101, the tallest building in the world, being hit by lightnight. There was loud thunder, lightnight flashes, and heavy rain. This followed on from last Saturday's typhoon which lashed Taiwan. Fortunately, the thunderstorm ended and the sun came out to shine. Douglas Keari and I visited an electronics shop in Taipei before returning to the Grand Hotel to rest. A small, but significant, anniversary took place on Monday June 18, 2007. That was the 65th anniversary of the sinking of the motor vessel Macdhui, sunk in the Port Moresby harbour by Japanese bombs in June 1942. One of the best-known landmarks in Port Moresby is the wreck of the Macdhui in the waters just off the Port Moresby Technical College at Kanudi. Many people just drive or walk past without knowing the significant role that the Macdhui played in the development of Papua New Guinea. Recently, I was asked to be a tour guide for a retired US veteran of the Korean and Vietnam wars, and one of the World War 11 relics I showed him was the wreck of the Macdhui. As we stood at Kanudi looking out to sea, I wondered what stories the deep blue sea, the rolling hills, and the wide sky could tell me about what they saw that fateful day in 1942. It was then that I realised that June 18, 2007, would be the 65th anniversary of the sinking of the Macdhui and decided to put pen to paper. The Macdhui, 4630 tonnes, built in Glasgow, Scotland, in 1930, was owned and operated on the Australia-Papua New Guinea service by Burns Philp and Company Limited. Macdhui’s maiden voyage took place in March 1931, sailing to Suva, Fiji, via the Azores, Jamaica, and the Panama Canal, with a load of coal. Then the Sydney to Rabaul route for Burns Philip with 167 first-class passengers’ accomodation. On June 20, 1931, a fire broke out on another voyage between Madang and Lae, but the passengers were safely taken ashore in lifeboats. MacDhui was safely towed to Salamaua, New Guinea's then administrative capital, by Neptuna, another Burns Philp & Co vessel. After patching at Salamaua, MacDhui was sailed to Sydney for six weeks of repairs. With the onset of war the ship was commandeered by the Navy and used to evacuate civilians from New Guinea, then carrying Australian troops back to Port Moresby. On June 17, 1942, the Macdhui was attacked by Japanese bombers as it was discharging to lighters in Port Moresby harbour. It began zigzagging around the harbour but took one direct hit which caused considerable damage. The vessel later went alongside the main wharf to unload dead and wounded. The next day, at 10.45am, there was another air-raid warning and the Macdhui moved out into the harbour and began manoeuvring. Soon after the raid began, it took a direct hit. The captain headed towards shallow water where his ship finally keeled over onto a reef. Ten of the crew of 77 were killed along with five Australian gunners from 39 Battalion. Altogether, the Macdhui took four direct hits. The dramatic sinking was captured on a black and white movie film shot by the famous Australian cameraman, Damien Parer from a nearby hilltop. The loss of the Macdhui was a great blow to the morale of the Australian troops in Port Moresby. Until then it had been the only regular and reliable link between Australia and Port Moresby. After the war, the Australian government compensated Burns Philp for its loss. The wreck itself is now deeply pitted and corroded under the waterline. It is gradually breaking up but even if it does slip completely under the surface part of the Macdhui will remain in Port Moresby. In the late 1960s the mast was removed and now stands outside the Royal Papua Yacht Club as a memorial to those who died. One of the bells was erected in the tower of St John’s Anglican Church in Port Moresby and to this day still calls parishioners to worship. Former vice-commodore of the Royal Papua Yacht Club, Trevor Kerr, tells of a supernatural experience in 1979 when the ashes of the late Captain J. Campbell, skipper of the Macdhui, were laid to rest with his ship. The powered launch Tina, owned and skippered by yacht club committee member Russ Behan, approached the wreck with Captain Campbell’s two sons, a United Church minister, and Kerr on board. “The weather in the harbour was unusually placid, not a zephyr stirred,” writes former Port Moresby diver Neil Whiting in Wreck and Reefs of Port Moresby. “The sea was so clear that the superstructure of the Macdhui could be seen below the surface of the water. “There was not a ripple on the surface or current drift to break the calm. “With heads bowed in prayer, the United Church minister upturned the urn containing Captain Campbell’s ashes and scattered the contents into the sea. “Trevor, observing the ceremony in a more detached fashion than the others, observed the most amazing sequence of events. “The ashes initially clouded the water as one would expect, but almost immediately condensed into a form similar to a teardrop. “Then, the most amazing phenomenon occurred. “The teardrop cloud quite rapidly crossed the six-metre intervening gap between the Tina and the Macdhui and disappeared into the hull. “At a nudge from Trevor, Russ glanced up and also observed the incredible event. “The engines of the launch were quickly started and in a state of chilled awe, the funeral party motored away. I've travelled back again to Taiwan for another workshop, this time the APEC OVOP (One Village One Product) Workshop on E-Commerce from August 20-24. I arrived in Taipei on Sunday August 19 with Douglas Keari from the Papua New Guinea Tourism Promotion Authority. Douglas is an IT Officer by profession. 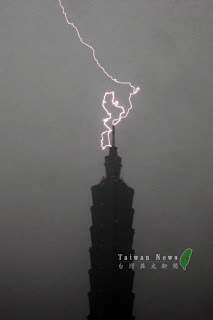 The weather was very bad after a powerful typhoon lashed Taiwan on Saturday August 18 and it was a very-turbulent four-hour ride from Singapore on a Singapore Airlines Boeing 777. We left Port Moresby for Singapore on Thursday August 16 and spent three days in Singapore. There are some things in life that are so hard to comprehend. These things make you wonder why some people have the audacity to carry out such acts, which include desecrating the memory of loved ones that families and relatives have laid to rest. These people can stoop as low as stealing brass plaques from graveyards to sell to unscrupulous scrap metal dealers for a fast buck. In my home town of Lae, this practice has been going on ever since these dealers - who prey on Papua New Guinea's massive unemployment problem - set foot. Today, a visit to cemeteries in Lae, will show you many headstones on graves that are missing brass plaques. A case in point is the old graveyard up the road from the famous old Lae airport. This graveyard is the final resting place for many of the pioneers of Lae and Morobe province, mainly expatriates, and was a relic of a bygone era where visitors could learn so much just by reading the plaques and headstones. Rest In Peace - RIP - those buried here are supposed to be. However, this has not been the case over the last 10 years or so, as grave robbers without a care in the world have plundered basically all the brass plaques. In my younger days, as a journalist in Lae, one of my hobbies used to be wandering old graveyards and reading the plaques and headstones as I could learn so much history. Sadly, I can no longer do this, as many of the plaques are gone. And the irony is that people are not making any noise about this daylight robbery going on in front of their own faces. The grave robbers are desecrating graveyards at the old Lae airport, Second Seven (Malahang), and even my Butibam village, to name a few. Heaven knows what would happen to the Lae War Cemetery if there wasn't tight security around to prevent these intruders. We never thought that this practice would come to Butibam until a few years ago when plaques started disappearing overnight. In May last year, while on a working trip to Lae, I visited my father's grave at Butibam and took pictures. A short time later, I was surprised to receive a call from my mother, who was in tears as she told me that Dad's plaque had disappeared to these unprincipled grave leeches. The entire family, just like me, was shocked as we wondered what exactly Dad or we had done to deserve this. The plaque, to this day, has not been replaced as I somehow have to find the exact wording for a replacement. My father, the late Mathias Nalu, died on September 17, 1993, after more than 35 years of service with the Education Department as a teacher and later a school inspector. He had just retired and received his final entitlements, however, never got to enjoy the fruits of his labour as he suffered a severe stroke from which he never recovered until his untimely passing. Dad was one of those old Dregerhafen and Finschhafen boys who was always proud to call Michael Somare, Paulias Matane, the late Alkan Tololo, and many more, "old school mates". Dad's school mates went on to become great leaders of this country while he chose to take the backseat as a humble teacher and school inspector. Hundreds of teachers and public servants packed the St Andrew's Lutheran Church at Ampo in Lae for his funeral service. The Nalu family was humbled by this show of respect from so many people from all over Lae, Morobe province, and PNG. I realise that times are hard, but to steal brass plaques from graves to sell to some dodgy scrap metal dealer for a quick buck is unforgivable. The new government should put in place tough legislation to combat those who steal plaques from graves and those who buy them. These offenders, as part of their rehabilitation, could be sent to Salamaua where the villagers there will teach them how to look after and respect old graveyards. The old Salamaua cemetery is a relic of a bygone era of the 1920s and 1930s when fevered gold miners from all over the world converged on this idyllic part of the world. To visit the old Salamaua cemetery is to step back in time, to a rip-roaring period when gold fever struck men from around the globe. Today the old Salamaua cemetery, or what remains of it, is well tended to by the local villagers. The graves are mute testimony to the days when European man, running a high gold fever, was claimed by a fever of a different kind. I have a very simple message for those who removed my father's plaque and those who bought it. "I find it very hard to do so." I must admit that it was a big culture shock for me when I arrived in Taiwan capital, Taipei, on the night of Sunday July 22 after a three-hour flight from Narita Airport in Tokyo. Yes, I’d heard from friends and colleagues about the technological powerhouse that is Taiwan, but seeing is believing. Neon lights bedazzled the night, skyscrapers were everywhere, and vehicles of every description zoomed by on super highways. In the distance, a juggernaut soared into the sky, which I correctly presumed to be the 101-storey Taipei 101, the tallest building in the world. I was in Taipei to attend a week-long APEC Digital Opportunities Centre (ADOC) Small and Medium Enterprises (SME) Entrepreneurship Workship funded by the Taiwanese government. Taiwan has a total land area of only 36,000 square kilometres, a population of 22.7 million, and per capita income of US$15,659 (K47, 000). It is the world’s 17th-largest trading nation and has 1.25 million enterprises, 1.22 million (97.8 per cent) of whom are SMEs. While advanced Asian countries have emphasised large corporate units, the Taiwanese economy is dominated by SMEs. While this might seem a disadvantage, the industry is structured in such a way that clusters of SMEs can service larger enterprises. The Taipei 101 epitomises Taiwan’s reach for the sky to become one of the most-prosperous and competitive economies in the world. 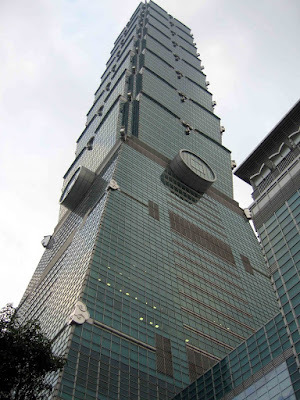 With a height of 508 metres – and 101 stories above ground and five stories – the Taipei 101 has surpassed the 462-metre Sears Tower in Chicago and the 451-metre Petronas Twin Tower in Malaysia to acquire the title “world’s tallest building”. Designed by world-renowned architect C.Y. Lee, the exterior of the building resembles bamboo segments, with eight stories to each segment because the number “8” signifies prosperous growth. Each segment is shaped like a sceptre, with ancient coins on the exterior of the 26th floor to give this modern building a Chinese style. To prevent the building from swaying during typhoons or earthquakes, an 800-tonne, US$4 million, ball-shaped damper is used to dissipate lateral vibration to a spring system underneath. For the first time in architectural history, the damping system is not hidden, but part of the building’s design. The world’s largest damper ball has a diameter of 5.5 metres and is visible from the 88th and 89th floors. Taiwan is one of the most-prosperous and high-tech countries in the world, and there is no such thing as poverty or unemployment. Its “cradle to the grave” health care and education systems are rated as among the best in the world. Everyone seems to have a mobile phone and computer, and there is wireless Internet everywhere, meaning you can use the Internet on your laptop anywhere, without the need for a wire connection. Taiwan, in fact, is now the world leader in producing notebook computers. Eveyrone seems to have one or more credit cards! The capital Taipei never sleeps and there are just so many people. And yet, just 50 years ago, Taiwan was a resource-poor under-developed tropical island. Through sustained good policies over the past few decades, it has lifted its population from poverty, joining the ranks of the most-prosperous and competitive economies in the world. Unlike Korea, Thailand, Indonesia, Malaysia and Hong Kong, it was able to weather quite unharmed the Asian financial crisis in 1997. Today Taiwan is a technological powerhouse that ranks among the world’s top producers of notebook personal computers, flat panel displays, modems, motherboards, and other electronic components and products. In 2004 it ranked fourth globally in the production value of its IT hardware. It is also fifth in the World Economic Forum’s 2005-2006 Global Competitiveness rankings, with a strong showing in the area of technology and innovation, ranking third in the world in the technology index. The 2005-2006 Global Competitiveness Report highlights Taiwan’s exceptional strength in technology issues, including an impressive capacity for innovation, firm-level technology, absorption, university/industry collaboration in research, and its pre-eminent position in the use of the latest technologies, from mobile telephones to personal computers and the Internet. Taiwan’s transition from a poor agricultural society into an increasingly-sophisticated powerhouse of high-technology manufacturing and the world’s leading producer of information and communication technology is, without doubt, one of the most-compelling development stories of the past half century. In his case study on Taiwan in the 2004-2005 Global Information Technology Report, F.C. Lin traces the evolution of Taiwan’s ICT industry through the first economic miracle of Taiwan’s transformation from an agricultural to an industrial economy (1953-1986) and describes the second miracle of its industrial restructuring (1987-2000), when low technology industries were forced to relocate overseas and were replaced by technology-intensive industries, particularly in the information technology sector. Lin attributes these to the following factors: strong government leadership in maintaining a high growth rate and a strong fiscal situation, manpower development with a high level of science and technology graduates, the coalescing of high-tech clusters following the model of Silicon Valley, the development of venture capital supporting hi-tech small and medium enterprises, and a highly-energetic private sector. He identifies the future challenges as breaking into the advanced industrial and research areas of application integration, technological innovation, and standards formulation as global competition reduces profit margins. In addition to manufacturing them, Taiwan is already moving fast to adopt ICT. The Institute for Information Industry (III) estimates that there were 8.92 million Internet users in Taiwan as of June 2004, with an Internet penetration rate of 39 per cent, growing 2 per cent the previous year, and showing signs of reaching saturation. About 12.2 million people, of 54 per cent of Taiwan’s population, were general Internet users – slightly more men (56 per cent) than woman (52 per cent). As for age groups, 95 per cent of people between 15 and 24 years, but less than 10 per cent of people over 60 were Internet users. Papua New Guinea can learn so much from the Taiwanese experience if we are to take our place in this ever-changing world. It was quite ironic that from July 23-27, while there was an all-out Information and Communication Technology (ICT) battle in Papua New Guinea between Digicel and Telikom, APEC member countries including PNG gathered in Taiwan to discuss this phenomenon of the so-called “digital divide”. I happened to be in Taiwan at that time and could only shake my head in bewilderment as I browsed The National and Post-Courier newspapers on hi-tech wireless Internet for the latest news from home. I might add here that while the newspapers were spot on, same could not be said of the Electoral Commission website, as there were no election updates the whole time I was in Taiwan. The ICT monopoly in PNG, exorbitant telephone and Internet costs, as well as unupdated websites for such an event as the PNG national elections, all contribute to this digital divide. Taiwan has a very reliable and cheap telecommunications system and is a hi-tech country where almost everyone has a mobile phone and a computer. Wireless internet is everywhere, meaning that you can use your laptop anywhere, without the need for a wire connection. 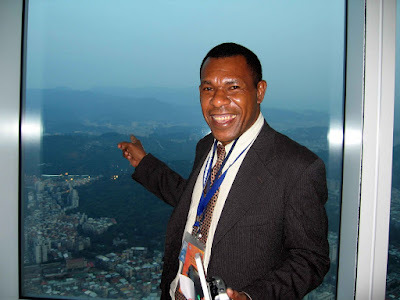 Papua New Guinea will continue to remain light years behind the rest of the world if we do not jump on the ICT bandwagon in this globalised world. As APEC member economies including PNG strive to build their ICT infrastructure necessary for the development of what economists called the “New Economy” – based on ICT – the phenomenon of the Digital Divide is also emerging. To tackle the divide, the establishment of the APEC Digital Opportunity Centre (ADOC) was advocated by Taiwan at the 11th World Leaders’ Economic Summit in Bangkok, 2003. It was envisaged as a concrete step towards realising the goals set out by APEC leaders at the 9th APEC meeting. Prepare APEC economies to use the Information Revolution as a passport to the New Economy. Taiwan is currently working with seven APEC partner economies including PNG on the ADOC project. The six other countries are Vietnam, Indonesia, Phillipines, Thailand, Chile, and Peru. ADOC offices have been set up in each economy to run the various programmes and ICT training centres, referred to as “Digital Opportunity Centres”, have also been set up to facilitate with training and capacity-building objectives. ADOC has been actively running programmes in PNG over the last three years, co-operating with various organisations and government departments, most notably with the Department of State Enterprise and Information. In August 2006, ADOC established its PNG office and a state-of-the-art ICT training centre at the University of Technology in Lae. The centre aims to provide digital opportunity – digital access and training – to those who have been traditionally marginalised by ICT: women, the unemployed and out-of-school youth. The ADOC programme is coordinated by the ADOC Secretariat based in Taipei. The Secretariat Office is currently run by the International Cooperation Development Fund and supported by the Institute for the Information Industry, two of Taiwan’s leading development and ICT organisations. The ADOC project runs a number of different programmes in partner organisations as well as in Taipei. One of these is the ADOC SME Programme, which I was invited to attend in Taipei. It coincided with the third ADOC Week as delegates came together to share experiences and expertise on bridging the digital divide. The workshop was aimed at providing participants from seven ADOC partner member economies with the fundamental knowledge of e-start ups. The objective of the SME Entrepreneurship Workshop was to share with the participants the successful e-commerce start-up experience given by Taiwanese professional businessmen and senior manager, as well as the advanced e-business strategies and technologies which allowed the participants to have an idea about methods to cut into the current e-commerce market. During the six-day workshop, Taiwan provided a variety of useful courses such as e-commerce management for SMEs and individuals regarding the aspects of e-business theory, legal issues and protections that outline the e-strategies of the e-business world. Moreover, seminars and case studies gave a platform to exchange the e-start up experience among the participants and the lecturers. In addition, a series of company visiting provided participants a chance of active learning outside the classroom. Deputy executive director of the APEC Secretariat, Ambassador Juan Carlos Capunay, highlighted the importance of ICT in this globalised world. “The digital divide within and among APEC member economies is an enormous barrier to the ability of the people in the Asia-Pacific region to participate in and benefit from the digital economy,” he said. “Access to Internet, adequate infrastructure, human capacity building and appropriate policies on ICT are central issues in addressing the digital divide. “Success in this globalised world is predicated on ICT knowledge and successful knowledge-based economies will be based on the efficient and widespread use of ICT by all sectors within any given country. “Small and medium enterprises, the backbone of Asia-Pacific economies, must be prepared with ICT knowledge. Ambassador Capunay could have been speaking directly to PNG.